Cape Foxes are a small species of fox. They have a body length between 45 and 61 cms (17.7 - 24 inches), a tail length between 30 and 40 cms (11.8 - 15.7 inches) and they weigh between 3 and 6.5 kgs (6.6 - 14.3 lbs). They are coloured silver grey on their back and yellow on their flanks and underside. Their long tail is bushy with a black tip and they have slender legs. 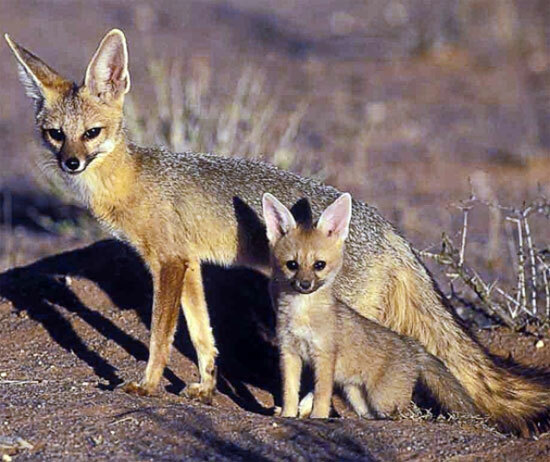 Cape Foxes are found in the savannahs and semi-arid regions of southern Africa. They are non-territorial and are either solitary or found in pairs. Their home ranges overlap and they tend to be between 1 and 4.6 sq. kms (0.4 - 1.8 sq. miles). They are mainly active during the night, although youngsters are known to play outside the den during the day. Cape Foxes are omnivores and they feed on small mammals, reptiles, insects, fruit and carrion. After a gestation period of 51 - 53 days, females give birth to 3 - 6 cubs. At birth the cubs weigh between 50 and 100 g (1.8 - 3.5 oz) and initially both parents care for the cubs. They begin to forage with their mother when they reach 4 months old and at 5 months old they become independent and disperse. Cape Foxes reach sexual maturity at 9 months old. Humans are predators of Cape Foxes and it is likely that larger carnivores and large birds of prey will also prey upon them.